Big three-track EP which has just been released this week as an exclusive on Beatport, with a full release on September 10th. With three completely different tracks, it’s already been getting loads of promo support from DJs across all types of genres. Second track, ‘Rocket Soul’, has been remixed by Germany’s Marten Hørger, who twists the life out of the classic Plumps’ track, adding all sorts of distorted twists and breaks. The third track is actually from Moby, who gets his ‘After’ tune remixed by Bonsai Kat, which results in a tough, four to the floor twisted slice of dance music with distorted breakdowns and all manner of effects thrown in. It’s getting great feedback. Our favourite though is the brand new first track, ‘A Hip House Experiment’, which does exactly what it says on the tin… in a Plumps’ style. It’s got a great beat, catchy hook and is full of energy. Add in the ‘90s style hip hop vocal on repeat, big drum rolls, warbling sirens and angry synths and you nearly get a feel for what it sounds like! 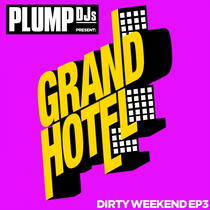 Catch Plump DJs in London on 21st September at The Nest in Dalston for a launch of the EP. I like the helpful information you provide in your articles. I'll bookmark your weblog and check again here frequently. I'm quite certain I'll learn many new stuff right here! Good luck for the next!